Irish Genre Painter, Noted for Breton Genre Pictures. A perfect example of Hill's naturalism. Born in Drogheda, County Louth, he turned down the opportunity of entering the prosperous family milling business in favour of a career as a painter, and studied at the Metropolitan School of Art in Dublin from 1877 to 1880, along with fellow students Roderic O'Conor (with whom he shared lodgings), as well as Walter Osborne, and Joseph Malachy Kavanagh. From 1881 to 1883, together with Kavanagh and Osborne, he studied at Verlat's Nature and Life classes at the popular Fine Arts Academie Royale in Antwerp. During this time he specialized in realist rural genre painting, featuring cottages, peasants and country scenery. He was also developing a talent for portrait art. In 1883, he won second prize for painting from nature, and began exhibiting with the Royal Hibernian Academy. In addition, he won the Taylor Scholarship from the Royal Dublin Society for his work Convalescence, and received a silver medal from the Metropolitan School of Art. Leaving Antwerp in 1883, he travelled with Osborne on a plein-air painting trip to the Pont-Aven school, in Brittany. 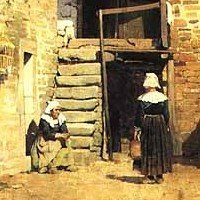 Here, he found a rich harvest of subjects for his rural and domestic subjects, becoming noted (like Walter Osborne) for the exquisite tonal detail of stones and bricks, which duly won him the Taylor Scholarship for the second year running, for his painting Breton Beggars. Hill's painting Sunshine, Brittany (pictured above) is a relatively recent discovery of the artist's work, which depicts a small courtyard, close to the main square at Pont-Aven, with a characteristic stone staircase leading to a pigeon loft. Sunlight illuminates the rustic setting. A similar picture of the same courtyard, was painted by his colleague Walter Osborne, illustrating how closely the two Irish artists worked together. After spending part of 1884 painting in England, Hill returned to Dublin, where he continued exhibiting at the RHA, and the Dublin Art Club, and also in British venues like the Walker Art Gallery, Liverpool, and the Royal Institute of Oil Painters. In 1892, he was elected an Associate at the RHA, and a full member two years later. In addition to his genre paintings, she also showed portraits in oils and charcoal. Sadly, however, sometime after his return from France, Hill suffered some kind of mental breakdown - no one in his circle of family or friends quite knew what happened - and as a result ceased painting altogether. He settled in the family home and did nothing; and in due course moved with his sisters to Wales where he died in 1930. Examples of his work can be seen in the National Gallery of Ireland, and in the Drogheda Municipal Library. The auction record for a work by Nathaniel Hill was set in 2010, when his French genre painting, entitled Breton Peasants at a Convent Door, was sold at James Adams, in Dublin, for €45,000.  For details of other genre painters, see: Irish Artists: Paintings and Biographies.  For more about plein air painters like Nathaniel Hill, see: Irish Art Guide.  For more about plein air painting, see: Homepage.